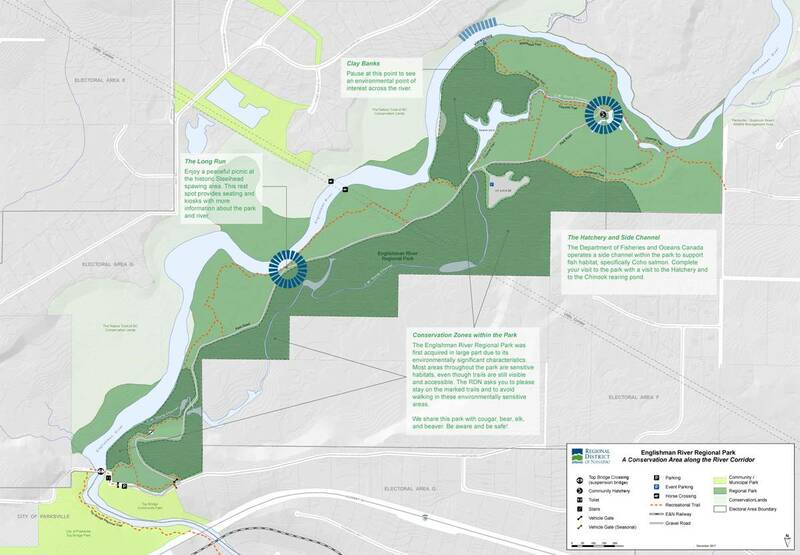 In 2005, the RDN partnered with The Nature Trust of BC, Ducks Unlimited Canada, the Nature Conservancy of Canada and the Province of BC to acquire this 207 hectare park and conservation area along the Englishman River. The regional park is home to numerous wildlife species including Roosevelt Elk and a community hatchery with extensive salmon side channel. Wander or ride the many forested park trails and admire the beauty of nature along one of BC's most important rivers. 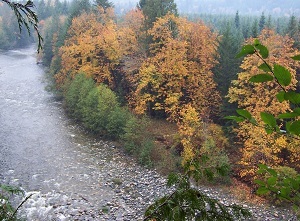 Spawning salmon return to Englishman River Regional Park every September and are celebrated annually there on BC Rivers Day. Finished your park adventure? Head off over the Top Bridge Crossing and the Top Bridge Trail to explore more of beautiful Oceanside. For additional information on the Englishman River Regional Park Management Plan, please Click Here. Approach the regional park from the end of paved Allsbrook Rd (off Bellevue Rd, off Hwy 4A) or the end of Middlegate Rd in Errington. 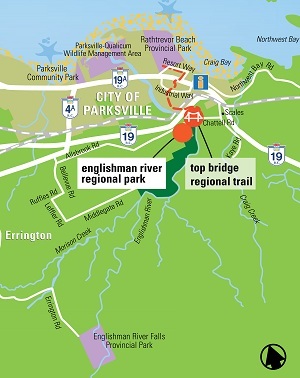 You can also reach the park by way of the Top Bridge Trail and Top Bridge Crossing.